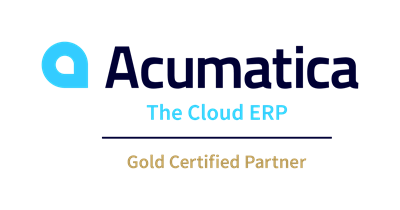 The Acumatica Gold Certification helps sets us apart with our 13 years of expertise in implementing and supporting Acumatica’s ERP solutions. Investing our time for continuous training is crucial because the Acumatica ERP solution continues to expand functionality and evolve with every update. Why Work with an Acumatica Gold Certified Partner? Competitive Edge – As cloud ERP experts, we recognize that our customer’s competitive landscape also continues to evolve. We understand the importance of keeping current with the latest capabilities of Acumatica and our experience in the ERP industry enables us to help our customers with their unique challenges. Commitment to Excellence – Our Acumatica Gold Certification represents our commitment to serving our Acumatica customers with the highest standards in our Acumatica ERP consulting practice. Expertise and Experience – As an Acumatica Value Added Reseller (VAR) with Acumatica Gold Certification, we provide two main services for Acumatica customers and partners that leverage our expertise. We provide Acumatica ERP software evaluation, implementation and technical services to customers in the Seattle, WA area. We support other Acumatica VARs and consultants whenever they need additional help with their Acumatica prospects in the sales cycle and with customer implementation projects. Acumatica VARs and consultants lean on Stratotech’s consulting expertise via “white label” services that offer cost-effective and highly skilled additions to their team when project work requires it. We specialize in Acumatica’s Business Intelligence, Customer Management (CRM), Distribution Edition, Commerce Management, Field Service Edition, Financial Management, Manufacturing Edition and Project Accounting. Request an Acumatica Cloud ERP Demo! This award is reserved to an elite group of Acumatica partners demonstrating proficiency the Acumatica ERP products and higher standards of ERP consulting practice. Stratotech’s Acumatica Gold Certification is a result of rigorous training commitment to maintaining the highest standards to effectively deliver results. “We invested in the Acumatica Gold Certification program because it’s important for us to keep sharp on our Acumatica product knowledge and maintain our high standards of excellence for our customers. The Acumatica Gold Certification represents our proficiency with over 12 years of combined experience working with the Acumatica ERP solutions.” – John Nicholson – Principal of Stratotech Partners, LLC.